Opal Khamsa Necklace. 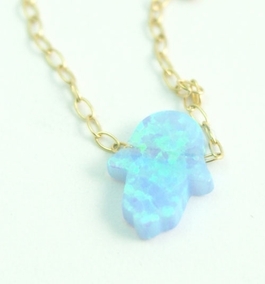 The pendant is a gentle pale blue Opal. The Hamsa is designed to ward off the so called Evil Eye. The Hamsa Hand, or Khamsa, is a symbol predates the rise of monotheistic religions, having been widely used in antiquity. Commonly used on pendants as a luck charm and amulate. Packaged Carefully with Care. Try our great gift wrap and gift message services. This Jewelry is made in Israel and Shipped with love from Israel. Comes with a delicate golden chain. * Express your empathy to the IDF and the Zionist state by wearing this necklace. * Pendant made of pure Stainless Steel. * Pendant Measurements: 48 X 26 mm. * Packaged Carefully with Care. Try our great gift wrap and gift message services. * Jewelry made in Israel and Shipped from Israel.